Silvia B. Espinal is a licensed clinical social worker and the Director of the Latino Youth and Family Immigration Project at Ackerman. 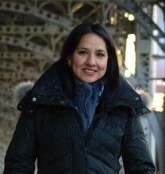 Silvia began her family therapy training while she was a graduate student at NYU Silver School of Social Work and had the opportunity to complete the Social Work and Diversity Program at the Ackerman Institute. Her interest in family and couple therapy persisted and she proceeded to conclude the Externship Program. Silvia is currently an adjunct faculty of foundations in family therapy at the institute and is also collaborating with the Gender and Family Project at Ackerman. Additionally to her professional training at Ackerman, Silvia completed a two year training at the Eikenberg Institute for Relationships in NYC where she focused on the integration of diversity and issues of social justice with clinical cases. As a Latina immigrant and a family therapist, Silvia’s biculturalism and bilingualism have helped her grow a genuine and unique passion in the immigrant experience and she uses this strength based approach when working with these individuals, couples and families. In addition to having a private practice in New York City, seeing a wide range of diverse populations, Silvia has extensive experience working in community mental health clinics, small psychotherapy group practices, and large inner-city medical settings.